New Update all archives:autoinstall for ProgDVB and Satellite Finder (FastSatfinder), full package zip archive and sorted (by polarization, by regions, by band). autoinstallation for ProgDVB and FastSatfinder, full package zip archive, sorted : by polarization, by regions, by band. Watch this short video to learn how to easily find the signal from a satellite. FastSatfinder really help me a lot. 3D satellite lookup based on 3D Google Earth creative technology. 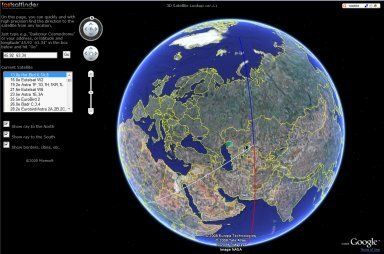 It online tool will help you quickly find the direction to the satellite from any location. Supported browsers currently include Firefox, IE6, and IE7, all only on Windows.